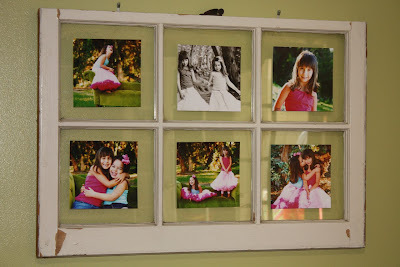 Here is a shot of my old window filled with Melinda Kim's photography. I love it. Will even love it more when the whole is finished. 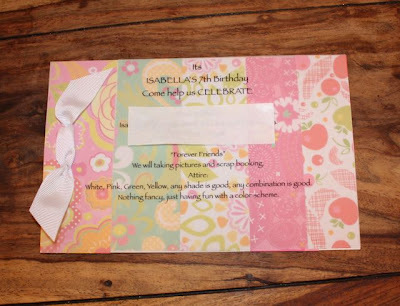 Here are some pictures of our "Friends Forever" Scrapbook Birthday Party happening this Sunday. The clean glass frames. I switch those photos out seasonally, birthdays and holidays. 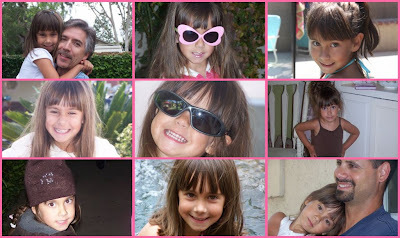 This time they are filled with Isabella through the years. 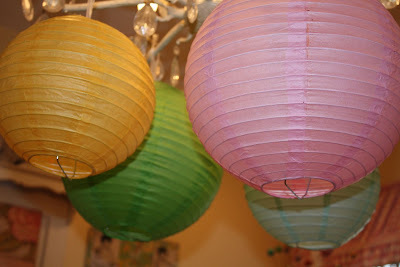 Rice Paper lanterns. Oh my gosh, don't you love them. They are so fun, so easy. So festive. I will probably start carrying them in SoSoBella Designs. And the invite. Super easy. 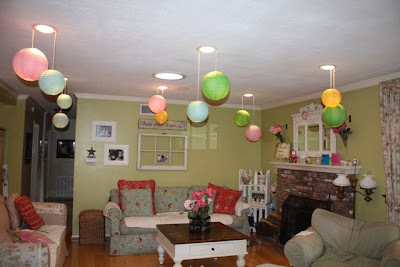 I do the same idea in different colors for different occasions. Printed the information on Vellum. Wah-la, done. Scrapbooks. Paper bag scrapbooks. Again, super easy, super cute! 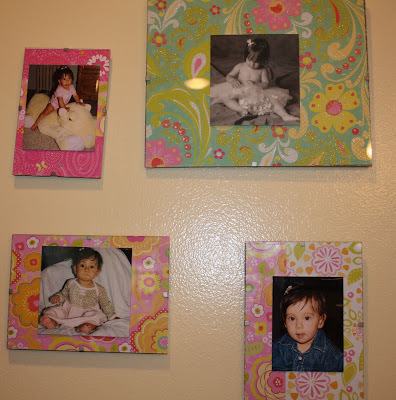 I have taken pictures of the girls over the years, so each girl will have a little over a dozen to put in their book. themselves. The pictures are printed and cropped ready to be scrapbooked. Should be super cute when they are finished. Stay tuned for more. 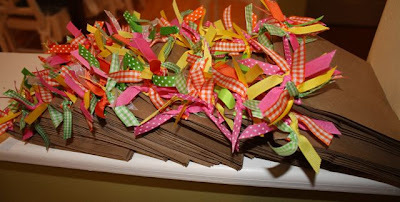 As I typed this Birthday Blog for you I have Country playing in the background on the computer (random, Pandora's music). And as I type this "I Hope You Dance" comes on. Now thats something. My song to you. You are the best kid any MoM could ever ask for. I L.O.V.E. You. What a fun softball season we are going to have. We have an awesome team, great parents and wonderful coaches. 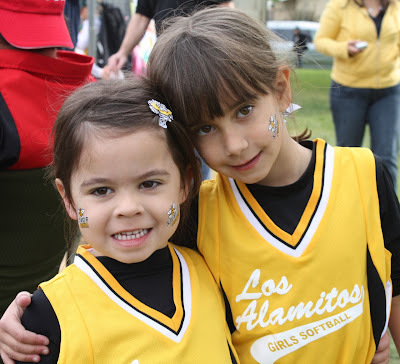 AND Isabella & Sophia get to play on the same team. So Cute, So fun! 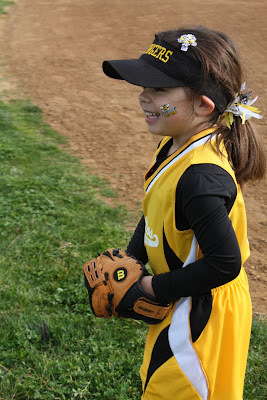 Here are a few pictures from our opening day parade and our first game. We were up at 5:30, the girls were up at 6ish. It was an early morning that's for sure, but the girls had a blast. First we paraded through the neighborhood on our way to the field. Then we had our first game at 9:30. 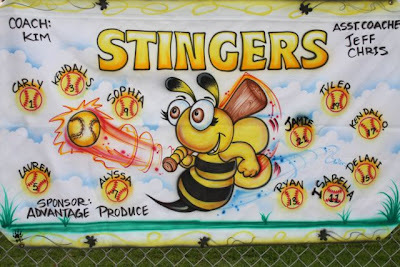 We are called "The Stingers" because of our colors of course, yellow and black. One of our Moms, thanks Jen, you RoCk, found these temporary tattoos. They were prefect! 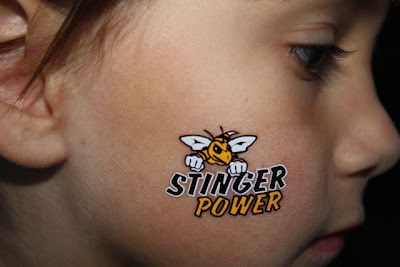 Stinger Power. My computer isn't letting me upload all the pictures. Hope the help desk at Apple can help tomorrow or I will be one bummed Mom. 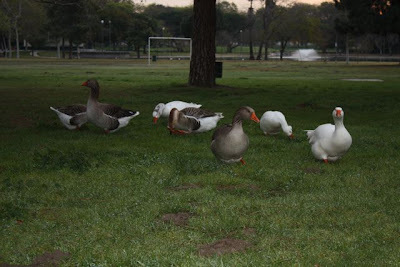 And the ducks. We pulled over on our way to the field to look at em' They were about 10 feet from the curb. I hope everyone is having a great week. Thank you to all of you who purchased my JOY. and or BLESSED. hand stamped tags for Cora Paige's Playground. They are done. They will be going out in the next couple days. 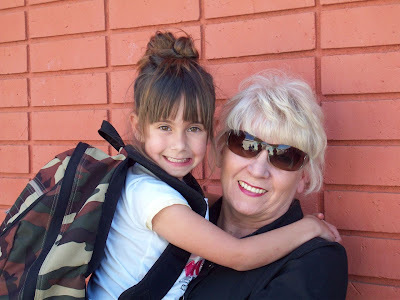 We raised over $200.00 together for her playground. 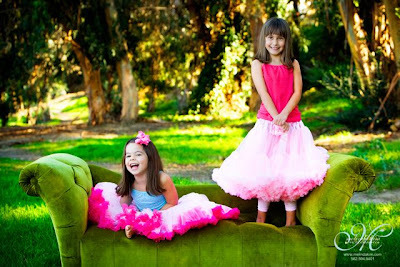 Today is the launch of Cora Paige's Playground on ETSY. Please visit Julie, at Joys Hope to read more about this Cora's family and the launch. Julie is an amazing person, with an amazing heart. Thank you Julie for asking me to be a part of such an awesome thing. You can also click here to see all the wonderful, talented people who are selling on Esty to help. A few weeks ago I read and learned about a little girl named, Cora Paige who lost her sweet little life a few days ago to cancer. Her Mommy and Daddy are building, Cora's Playground, at their church in her honor. There are amazing people in this blog world, who do AMAZING things. A group has been formed on ETSY by some incredible women to help Cora's parents. All proceeds of these products will be donated to the Cora Paige Playground project. I am so proud to be able to participate in such a wonderful thing. 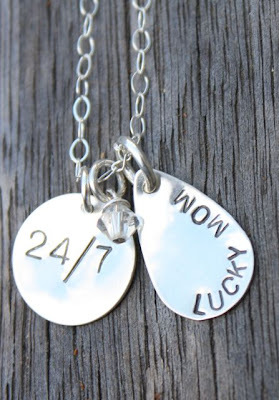 You will find my hand stamped tags here. Please, pray for these sweet parents who have lost their baby way to early. They will need your prayers to get through this hard time. Hug your kiddos a little longer today. What a fun Valentines Gift, click here. When you get there click on create. 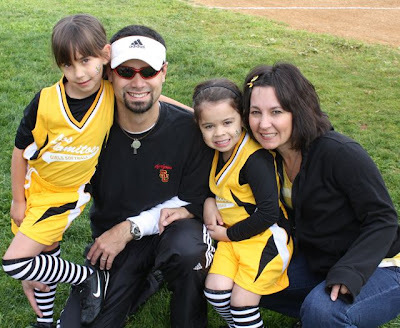 I am going to do it for my girls tomorrow. Print it out. Embellish it a little. Frame it. Might even do it for my hubby. Try it, its fun. It seems its going to be a busy week for us, so I thought I'd get stuff done on our day off. We are listening to country music, enjoying the day. Isabella's school is celebrating the 100th day of school this Friday. We have to decorate a shirt with one hundred things on it. A little challenging but we got it done. I will share pictures on Friday. Its also Valentines Day, and we will be exchanging Valentines on Friday. Here is what we are doing. 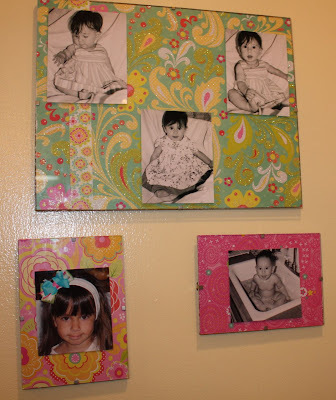 It was a Pottery Barn Kids idea a few years ago. Its easy, its fun and the kids can do it on their own as long as they can cut. I cut 20 pieces of card stock in 6 x 6 squares. Let your kiddo cut out the hearts. 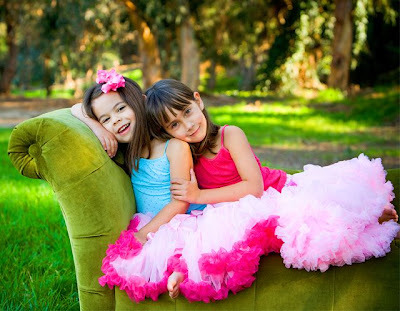 Embellish them with hearts, stamps, glitter, etc. Punch 3 holes with a hole punch, punch them in a cluster, on each side. Why 3 holes, so the pencil can fit through. Slide a pencil through the holes and your done! You can get 10 Valentines Day pencils for a $1.00 at Target. There are a few more pictures of the girls photo shoot here. I'm telling you, she is the best! I made this last year but was never really happy with the way it turned out. Well, yesterday I played around with it again and WhaLa, here it is. I love it. I am a 24/7 Lucky Mom. 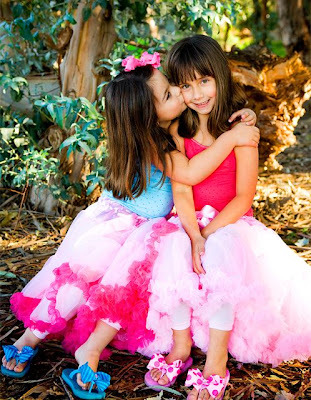 OMG, they are soooooo cute!!!!!!! Thank you so much and your packaging is great!!!!!! I will be sure to send you a pic with them wearing them for the big day!! I think its time for a give a way. Check back tomorrow to see what it is. Know anyone getting married? I am creating a line of Wedding Party Gifts. 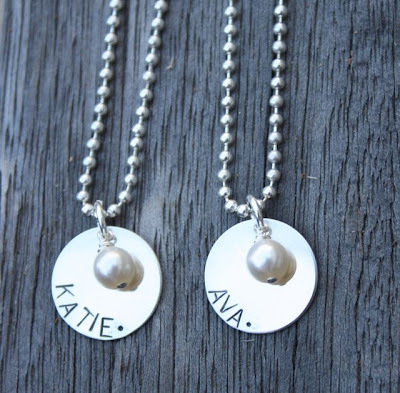 I just made the 2 circle tags for a bride who ordered them for her Flower Girls. 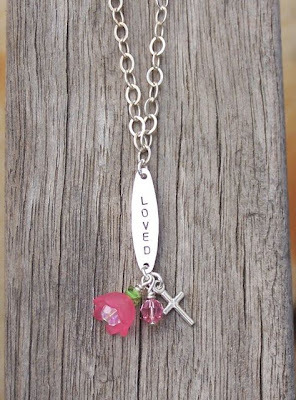 And the "loved" necklace is one of my first designs but I think it would make a great flower girl gift too.